Apple Piazza Liberty opens Thursday in Milan<br/>Apple Piazza Liberty Will Revitalize a Piazza in the Center of Milan<br/>Milan — Apple today premiered Apple Piazza Liberty, a new retail location that will revitalize a piazza in the center of Milan. The project, which includes both a grand public plaza and a store below, brings Apple’s latest retail design to Italy for the first time. <br/>Just off the Corso Vittorio Emanuele, one of the most popular pedestrian streets in Milan, visitors will first see a dramatic glass fountain that serves as the entrance to the store and a backdrop to the large outdoor amphitheater. The piazza, clad in Beola Grigia, a stone used throughout Milan, is open to the public 24 hours a day and will host special events year-round amongst 14 Gleditsia Sunburst trees planted in the area. <br/>Apple Piazza Liberty provides a grand venue for Today at Apple, free hourly sessions on photography, filmmaking, music creation, coding, design and more, that aim to unlock creativity in all attendees. This September, Apple Piazza Liberty will host a special month-long Milan Series, where 21 local artists will share their visions for the creative future of Milan. <br/>After descending a stone and metal staircase cantilevered from the Beola Grigia wall to the store below, visitors will be met by a team of 230 highly-trained employees, many of whom come to Milan from Apple stores around the world. 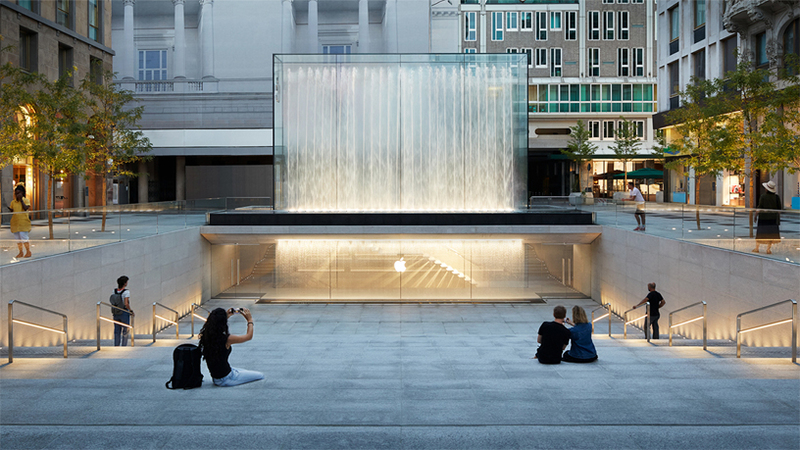 <br/>Apple Piazza Liberty opens Thursday, July 26, at 5pm, and Today at Apple registration is available now at&nbsp;<a href="https://www.apple.com/today/" target="_blank">apple.com/today</a>. <br/>Apple revolutionized personal technology with the introduction of the Macintosh in 1984. Today, Apple leads the world in innovation with iPhone, iPad, Mac, Apple Watch and Apple TV. Apple’s four software platforms — iOS, macOS, watchOS and tvOS — provide seamless experiences across all Apple devices and empower people with breakthrough services including the App Store, Apple Music, Apple Pay and iCloud. Apple’s more than 100,000 employees are dedicated to making the best products on earth, and to leaving the world better than we found it.